If you’ve ever struggled with how to pull quick reports comparing multiple properties or how to customize and automate dashboards with your data, the Google Sheets Add-On is worth looking into. It’s free, it’s simple and it allows you manipulate your data outside of the Google Analytics interface. The introduction is here to get started in case you haven’t used it before. If you have completed that quick-start guide, read on for the second guide to using segments and filters. ‘ga:pagePath’ is the dimension, ‘=~’ is the operator for ‘matches’ and ‘/blog/’ is the subdirectory that I want to filter on. If we want to create a filter showing blog pages or contact pages, I would use a comma and it may look like this- ga:pagePath=~/blog/,ga:pagePath==/contact. However, if we want to filter data to look at only blog pages and only users from an .edu network it would look like this- ga:pagePath=~/blog/;ga:networkDomain=~.edu. The syntax can be tricky, so there’s a handy guide for Filters with the API to help you. Subsetting your data into specific segments of sessions or users is one of the most valuable tools as an analyst. To use advanced segments with the Google Sheets Add-On, you have a couple of options. If it is already created, one way to get the segment’s ID is to use the Query Explorer. In the segment dropdown menu, the ID will show automatically and you can copy-and-paste it right from the page to Google Sheets. The last part after ‘user’ is the segment ID. The important thing to remember is to specify the scope of the segment (users or sessions). And again, there’s documentation on Segments with the API to help you out! 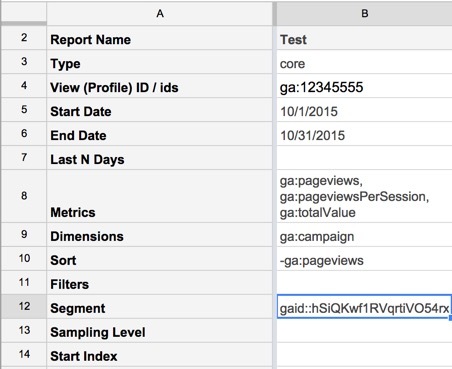 The ease of adding segments and filters in the Google Sheets makes the add-on one of the quickest ways to use the Core Reporting API. For all the dimensions and metrics available with the API, check the reference here.